Tequatl the Sunless is an Undead Dragon minion of Zhaitan. He spawns in Sparkfly Fen on the Splintered Coast. He was the first boss to be updated into a more difficult battle, requiring skill and coordination to defeat him. This guide is meant to be a simple, yet detailed version on how to defeat the dragon, and everything you need to know about defeating Tequatl the Sunless. DISCLAIMER: This guide is still a work in progress, especially the builds. Stay tuned for updates. Will also add video guides on the build rotations, along with multiple images to be as specific as possible. There will also be updates to this guide to "clean it up" and make it look nicer. Special thanks to Mealla for helping with this guide and editing the rough drafts to make this look even more awesome! 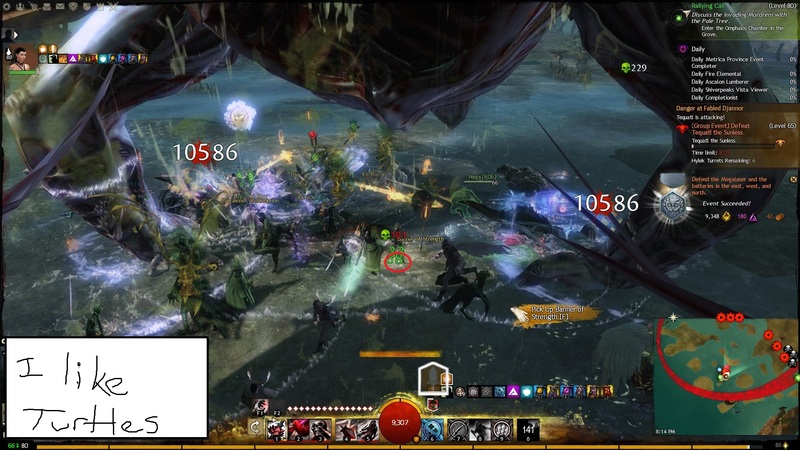 Tequatl has a handful of attacks he uses to down the zerg and become victorious. It's important for the zerg to know the attacks' animations and how to react to them. Stomp (12-15k damage): If you are under the foot when it hits the ground, then you will taste the full fury of the foot. There is a high chance you will be downed instantly. Shockwave (2-3k damage + knockback): If you get caught in the aftershock of the stomp, in addition to being knocked down, there is the threat of being knocked into a poison field. The shockwave can be avoided by either jumping over the wave or dodging BACKWARDS. The reason it's best to dodge backwards is that you will completely dodge the wave. If you dodge in a different direction you will likely put yourself into a position to get hit by the wave when you're done with your dodge roll. If you would like to jump over the wave, the best opportunity to do that is instantly when HIS right foot lands. If he stomps with HIS left, wait about half a second and then jump. Best chance of avoiding it however is to dodge backwards. 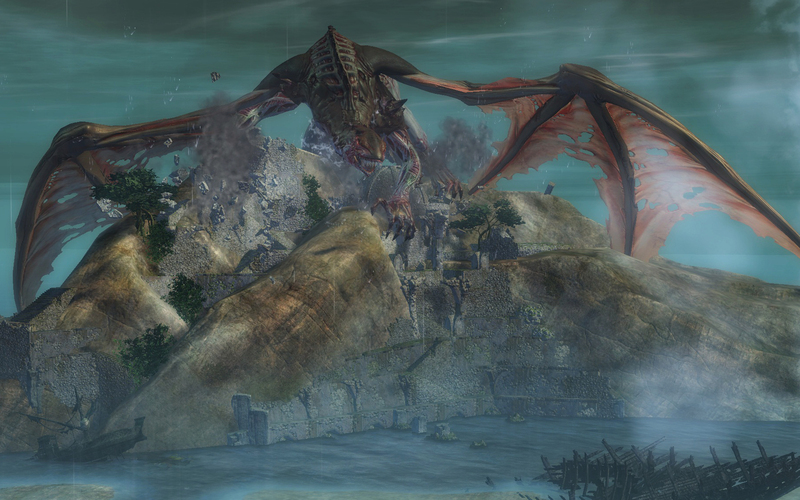 Tequatl will breathe out a bunch of projectiles that hunt down their targets. This attack is pretty useless, but it can be troublesome if no reflects are up. Sometimes it's defense team people or turret operators as well. These will ALWAYS track you down unless reflected or dodged/blocked. These deal about 2k damage to their target and knocks them back. Since reflects are a MUST for Tequatl, this attack should never cause any issues. Dodge towards Tequatl right before he breathes. Pop your stability right before he breathes. Failure to do so will cause you to run in fear for roughly 10 seconds, and can sometimes put you close enough to a defense team to upscale the mobs. When Tequatl spawns his fingers, he'll throw his front feet into the ground and spawn fingers in a circle around him. He doesn't do any damage to you directly, but fingers are the sole reason why reflects are very important to bring to the Tequatl fight. Fingers will occasionally throw poison at one target. If not reflected, the poison will land on that target and create a large AoE circle around that target. You will take a LOT of damage if inside one of these AoEs. Luckily the turrets can cleanse the field of these poison fields, but since they deal around 1.5k to 5k damage PER TICK, you want to avoid getting hit by them at all costs. Reflects are VERY important to keep up to prevent this from happening. This is why many commanders stress about bringing reflects and keeping them up. The fingers themselves can be destroyed, but have quite a bit of health and at the rate they spawn, we just let the reflects take them out for us (except for when entering a battery phase). So remember, bring reflects to counter these fingers. 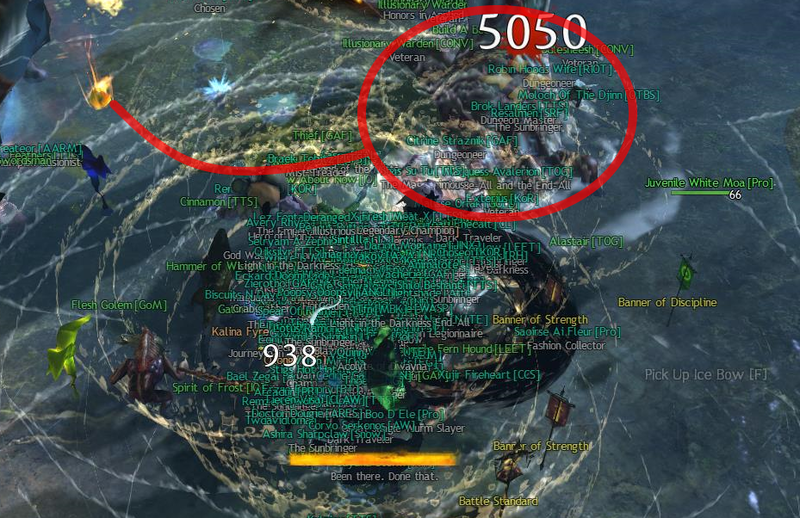 Between 0% to 75.9% health, whenever Tequatl uses his finger attacks he will also spawn whirlpools (which will appear as orange AoE fields with a whirlpool effect). These are annoying attacks that will drag you into the water under the map, where you will take a low amount of damage over time; there'll also be the occasional shark which also deal low damage. If you get pulled down, swim up into the white lights above to return to the battlefield. To avoid these, whenever Tequatl is below 76% health, scatter, and avoid the orange AoE fields. Just keep in mind the orange AoEs will sometimes disappear BEFORE the attack actually hits (as with the wurm's spit). You can sometimes see the attack as it looks like fingers grabbing in an area into the ground. Tequatl uses this attack very often. The tell is a "Force Choke" (imagine Darth Vader). Tequatl will spawn about 5 large AoE cripple fields. These fields do low to medium damage, but can be a real pain if all 5 are spawned on top of the zerg. These CANNOT be cleansed. The best counter is to use area heals and drop water fields. Guardians with "Receive the Light" heal skill work wonders here. Turret operators should be using their 5 skill to give extra boons to help tank the fields. If you cannot survive, feel free to dodge roll out of them and wait for them to disperse. Luckily, these target 5 random players on the beach, so they sometimes do target Turret operators or pets/illusions/players out of place, making it a bit easier on the zerg. Tequatl has a buff called "Hardened Scales" that slowly increases to 20. It can be countered by the turrets using the 2 skill on Tequatl's head. If it ever reaches 20, Tequatl will go invulnerable and will spawn a bone wall around him. He will not be vulnerable until the bone wall is destroyed. If this ever happens, kill the bone wall directly behind the zerg. You only need to destroy one section of the bonewall to destroy all of them. However, he immediately stomps after the wall is destroyed, so be cautious and be ready to dodge. If all turrets are doing their job, this attack should never happen. Tequatl doesn't have any animation for this attack, but occasionally bloated creepers spawn around him. These are slow moving, undead Norns that will slowly walk towards a player. The best counter to this is to push them back. You can have a guardian easily destroy some by using the greatsword 5 skill on a group of them, pulling them to that guardian, and waiting a second and dodging when they start their animation to explode (see the Gif above). If one makes their way to the zerg and explodes, it will put down an AoE field that does massive damage. These CANNOT be cleansed. It's VERY important to knock back bloated creepers if they ever get near the zerg. NOTE: These builds are WAY out of date. I will not be updating them anymore. It's not worth the effort to make a bunch of builds, spend money on gear and make a bunch of videos and what not. If you need builds, just search for some online and on youtube as the meta is constantly changing and with HoT, the meta for raids is likely a decent enough meta for open world bosses. The Elementalist is responsible for keeping fury and reflects up at all times. It is HIGHLY recommended to equip a focus for Air 4: Swirling Winds. This is a massive AoE projectile destroyer. With the 20-second cooldown and the 6-second duration, a coordinated group of 4 Elementalists can completely protect a zerg from taking poison damage from fingers. 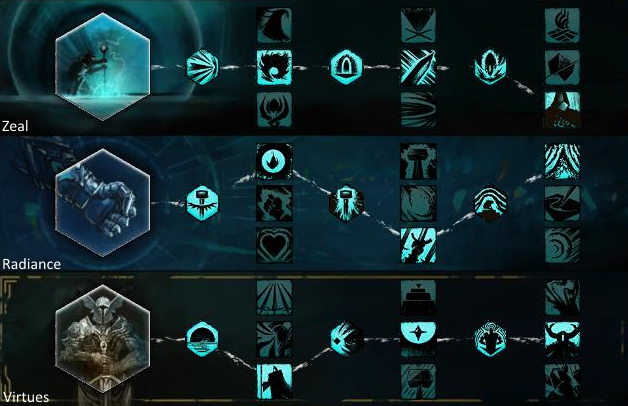 If you have a guardian in your group, swap out Armor of Earth with either Glyph of Storms or Signet of Fire for more precision. Dodge roll out of Cripple Fields backwards if you feel the cripple fields are too much to handle. Sometimes cooldowns get messed up or a poison recently hit and was cleansed quickly, leaving you at lower health. Use Earth Attunement if you need a blast finisher (focus 4) or invulnerability (Focus 5). Remember, Elementalists are the prime reflectors now. Focus on using Swirling Winds as much as possible, especially when LH is on cooldown. Warriors are easily the best might-stackers for Tequatl now. With the ability to critical hit Tequatl, Forceful Greatsword and Phalanx Strength are an absolute MUST to maintain might stacks. With the rest of the build, you will have roughly 90-100% critical hit chance. You should NEVER drop below 25 stacks of might for you and your party (assuming they are all stacked on the commander tag). Use Healing Signet and Signet of Fury when off cooldown. This maintains your signet precision and helps maintain might. Signet of Fury will also completely fill your adrenaline. Use Greatsword 2 (Hundred Blades) when it is off cooldown. This will also almost completely fill your adrenaline. Use Arcing Slice (F1 for Greatsword) when it is off cooldown. This maintains your extra 20% damage. Never weapon swap. Greatsword is all you need. Save conjurer weapons for other classes. If you have a mic, call out your warbanner when dropping to prevent wasted revives. The Thief provides pure DPS and some assistance in reflecting poison (although smoke screen will only destroy the cloud). Keep the smoke screen up, and utiliize the high DPS from spamming 1 and occassionally the 5 skill. Using Dagger Dagger, the thief is to spam their 1 skill while every couple of seconds using Cloak and Dagger to use stealth to get your power bonus from Revealed. There isn't much more to a thief than simple DPS. Be in full zerker. You're strictly DPS. Equip a dagger in the mainhand slot for your first weapon slot. Then place your other dagger in the off-hand spot in the second weapon slot area so that both weapon swaps are Dagger/Dagger. You will be using Dagger/Dagger the entire time, so having the weapon swap is to utilize the Quick Pockets trait. Use Steal only for Mug's heal. It will place you out of position towards one of Tequatl's feet. Run back to the zerg after stealing. Spam the 1 skill and use 5 whenever you don't have Reveal (which lasts only 2 seconds). This reveal debuff gives you +200 power. You do not hit Tequatl in the back. Don't even try to as it's a loss of DPS and requires you to be out of the stack. You only use the 5 skill to grant you reveal after hitting Tequatl with backstab. Lay Smoke Screens around the zerg. These are mediocre reflects. Do not use your signets. Thieves Guild only during battery phases as they will get killed before doing anything most likely. Unfortunately the other elites are equally bad. Weapon swap if low on initiative. The Mesmer isn't a heavy damage dealer, but act as force multipliers to maximize group DPS by spreading boons to allies. 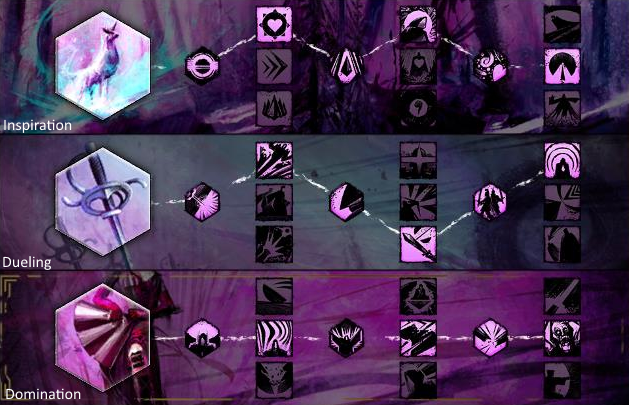 Using Signet of Inspiration through illusions and your utility, a mesmer can help maintain permanent uptime of buffs. This is a build used for the zerg fight. Defense teams may have a more optimal build. This build uses sword 1 and 2 to maintain extra ferocity, while also maintaining illusions with focus off-hand and sword off-hand. Spam illusions to keep Signet of Inspiration procing. You get 2 signets every 24 seconds with this build. Use Signet of the Ether (your heal) to recharge your phantasms. Spam sword 1 and 2 on Tequatl for double damage. 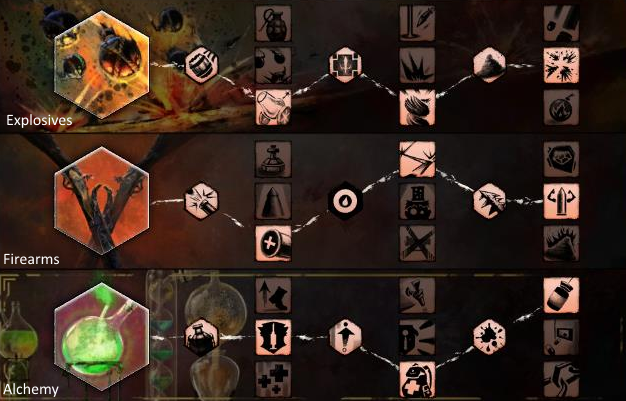 Maintain your 5 skill on both weapon sets for illusions. Do not use sword 3. You want phantasms, not clones. There isn't much need to shatter with this build, unless you happen to let clones out. Although you use Mental Anguish, the other traits are even more useless. Target Fingers that are using their animation to throw poison and use feedback on them. This will help protect the zerg and demolish fingers. Use your Mantra for stability often. Just make sure you have it during fears, but with the low cooldown and the 3 stacks, it's okay to use it if you get hit by a wave. Use Time Warp when off cooldown. Quickness shouldn't be an priority ever, however. 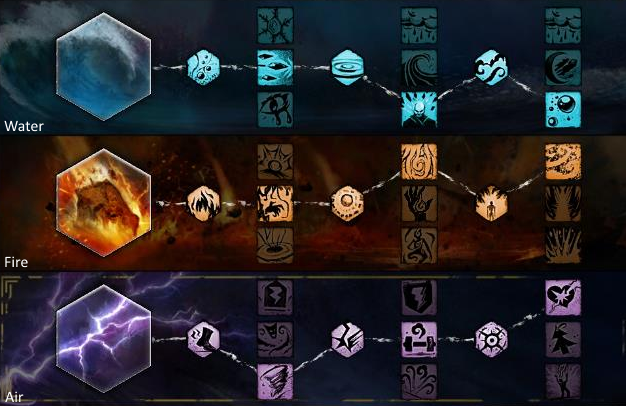 Casting a Signet with this build gives you and your allies 1 second of invulnerability. Cast your Mantra to make sure you can activate it. Cast Sword 5. Swap to Focus. Cast Focus 5. Spam these 2 whenever off cooldown. Use Sword 1 and 2 for your simple DPS. Use Signet of Inspiration when off cooldown. Target fingers for feedback. Maintain your illusions and signets whenever possible. The Engineer is a heavy damage dealer utilizing bomb kit and Elixirs to help maintain buffs and deal high damage to Tequatl. Engineer is currently one of the highest damage dealers to Tequatl, and can sustain high might and damage by themselves, along with reflects and stability. 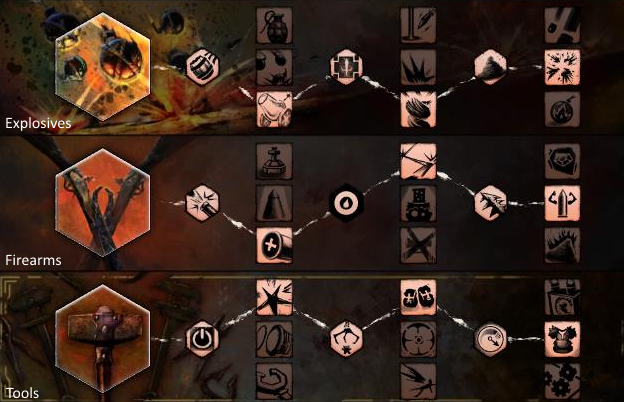 There are two variants to this build. Spam F4 as a reflect. This will grant a wall of reflection or a smoke screen. Both can prevent poison from hitting the zerg. Use F2 (with Elixir B) for stability before fears. If you get feared, your Elixir U is a stunbreak. Bomb kit is your main DPS. You may need to move a TINY bit to the left of the commander to get double damage. Just make sure you place your reflect (F4) on your left to protect the zerg and yourself. Bombs 4 blinds and doesn't do any damage. It is useless. It also creates a useless combo field (smoke). There is no need to ever waste time using it. Bomb 5 is just more for the laughs. Otherwise it's still completely useless. Use Big Ol' Bomb (F3) as a blast finisher. Drop that first then wait a second and drop bomb 2 to blast your own fire field. Rifle isn't necessary. You will be mainly in bomb kit. If you are fast with the rotation and can hit double numbers however it's not a bad choice. Mortar kit is also fairly useless. You can use any elite, but you'd be losing DPS by wasting time to cast it. Equip Bomb Kit, Bomb 2. Spam bombs 1, 2, and 3. Spam F1, F3, and F5 for extra DPS during the fight for extra DPS. Use F4 for a wall of reflection/smoke screen. The Necromancer is another heavy damage DPS class. This class utilitizes spamming wells and dagger 1 to maximize the DPS on Tequatl, while also using Death Shroud 4 and 5 to maximize the DPS occassionally. Using Death Shroud during the Fight Phase may be a bit difficult as it requires precise positioning and isn't recommended for newer Necromancer players. However, if Lich Form is off Cooldown during a burn phase, Death Shroud's Life Blast is great DPS (see the gif for positioning). Do not use Dagger 2 and 3. Dagger 2 is bad DPS and Dagger 3 is useless as Tequatl doesn't need to be immobolized ever. 4 and 5 with dagger off-hand is decent damage. Focus 5 is good just to add DoT bonuses. Use Death Shroud 4 and 5 when off cool-down to add great DPS. Your heal skill is an area heal. Great for cripple fields. Keep in mind it is NOT a water field. Use your two wells when off cooldown. These are AoEs that do HEAVY damage. Do not activate Signet of Spite. It is used to give increased power. Lich Form is best saved for burn phases. You can do very high DPS during a burn phase with Lich Form. See the gif for positioning to maximize your DPS. Lich Form can be used during the fight phase, but like Death Shroud, positioning is key. Use Death Shroud 4 and 5. Use dagger 5 for bleeds to activate your signet of lesser vamprism. There are two decent Guardian builds to bring to Tequatl. One depends more on being a support class, sacrificing DPS. The other utilizes removing some support for more DPS. When commanding, I prefer to have the support. The Guardian is GREAT for keeping your allies alive, utilizing a powerful area heal and keeping stability up often and using your short cooldown elite to help maintain quickness for the zerg. Use Greatsword and Staff. Staff is good to build up empower. Otherwise you'll want to be in GS most the time. "Receive the Light" (your heal) is a VERY powerful Area heal. Use it during Cripple fields or anytime the zerg may get hit by poison. Use Stand your Ground before Tequatl breathes. You may also use this if he recently used a Fear Breath as that skill of his has a cooldown that is much longer than Stand Your Ground. SPAM "Feel My Wrath!" often. Enough guardians using this ability can maintain also permanent quickness and fury. Purging Flames can be swapped out for just about any skill. Recommended are "Hold the Line!" or Shield of the Avenger. It's mainly just a great fire field, as elementalists will be using focus which lacks a big AoE fire field. Res the down. This is your job. It also provides a powerful reflect when you revive people, and people you res will be getting protective boons. Do not use F2. Keep it on passive unless it's an emergency. This is like Soothing Mists for Elementalists. It's an extra regen that helps keep the zerg alive. Aim your heal at your allies. It heals in a cone shape in front of you. Main Phase - Tequatl stands in one spot as the zerg attacks him. The Turret Operators deal with boss mechanics, and the defense teams deal with any mobs and fingers that spawn. At 75%, 50%, and 25% health, Tequatl will go invulnerable and then fly off, at which point the event switches to a battery defense phase. Battery Defense Phase - Players must split up evenly between the 4 objects (3 batteries and the mega-laser) and keep them alive for 2 minute. After the timer runs down, the laser will shoot Tequatl out of the sky and stun it, thereby starting the burn phase. Burn Phase - Tequatl takes increased damage, but will eventually recover and transition back into the main phase. If the zerg manages to bring Tequatl down to 75%, 50% or 25% health, then it will immediately jump into the battery defense phase (known as chaining the burn). The zerg will engage Tequatl at melee ranged, dodge the waves, and keep up reflects. If you're not familiar with the animations, then listen to the commander to stay alive. The zerg needs to bring as many reflects as they can and to keep them up as much as possible. Space reflects out to minimize downtime. Reflects are VITAL to keep the zerg alive from fingers. No reflects, no dead dragon. It's important you are melee because range deals a LOT LESS damage than melee does unless you are specifically traited for ranged. ...for double numbers on Tequatl with cleave weapons and skills. ...for easy access to Conjured weapons. ...for buffs from the Turrets. ...for buffs from Warrior banners. ...for revives from Battle Standards. Bring area heals as well as water fields & blast finishers. Use them when your health is low or when cripple fields are present. When Tequatl does his fear attack, you'll want to have a stunbreaker, stability, or a dodge ready. Guardians should focus on picking up conjure weapons. For additional strategy, look at the builds section. 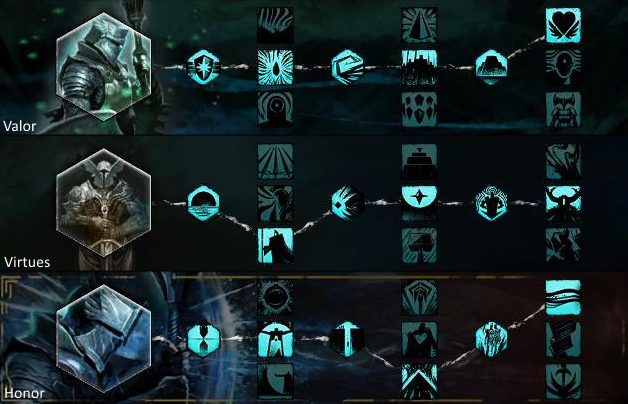 Even if you aren't using the recommended builds, generally the strategy for each profession is in those build guides. 1 Stacking tightly means better reflects because fingers target a player. If a player is off stack, and is targeted by the finger with it's poison, the poison will miss the reflect and create an AoE on that player. If that player is close to the zerg, but still off stack, the AoE will be big enough to cover the people in the zerg and deal damage to them as well. Stacking tightly prevents this from happening, meaning position is crucial in protecting the zerg. The Turret Operators will use the turrets to manage stacks of Hardened Scales on Tequatl, cleanse poison pools and buff the zerg. There are 6 turrets, numbered 1 through 6 for convenience, starting from the east and going counter-clockwise. Each turrets share the same role, as all turrets can reach the commander and zerg. All turret operators should test to see if they can reach the zerg with their 3,4, and 5 skills. If not, they need to move closer to the zerg or hop on their turrets to get the maximum range. Turret operators should not be worrying about the 1 skill. The turrets mainly want to focus on targeting Tequatl's HEAD and using the 2 skill to keep it on cooldown. This keeps the Hardened Scales buff from reaching 20 and creating a bonewall. All 6 turret operators should spam the 3 skill (cleanse) on the zerg at ALL times to get rid of any poison IMMEDIATELY if one is to land on the zerg to prevent a wipe. The 4 skill should be spammed on the zerg whenever off cooldown for offensive buffs. The 5 skill should be saved for cripple fields to protect the zerg with protection and regen. Turret operators are also responsible for cleansing (3 skill) themselves and each other should a finger land a poison cloud on them. If you cannot survive while cleansing yourself, ask another turret to cleanse you via Teamspeak. Turrets are very important to keep alive, so don't hesitate to call for a cleanse on your turret if you need it. Operators should notify the defense teams when their turrets are low on health. Before heading to defend a battery, a turret operator should repair their turret with the hammers on the ground near them before heading off to defend. Defense teams are responsible for preventing mobs from reaching and destroying the turrets. There are areas where mobs spawn. Mobs will spawn at 14 minutes and every minute and a half afterwards (14:00, 12:30, 11:00, 9:30, 8:00, 6:30, 5:00, 3:30, 2:00, 0:30). These times go by the time remaining in the event. Defense teams should be filled with 3 to 5 people per position. No more due to upscaling. For the easiest defense, 4 is a good number, but so more people have opportunities for defenses, we stick with 5 per team. There are a South Boats, North Boats, and North Hills and South Hills as defense teams. Check the map and the defense team area of this guide for more information on defense teams. North Hills is responsible for clearing the fingers near the Northern Turrets. A good group involves a mesmer with feedback to help protect the turrets from the poison and cause those poison clouds to damage themselves. They are also responsible for assisting the turrets with repairs if their health is low. If numbers are low, or defense teams are becoming hard to come by, this team can be scrapped and North Boats can fill the role if experienced, however this is not recommended unless it is needed. North Boats is responsible for killing the mobs at the Northern Spawn. If a champion grub spawns, ask for the ERT to assist. Watch the timer for the event to see when Mobs spawn. Focus more on keeping the mobs away from the turrets rather than worrying about killing the mobs. Though the mobs should be killed, they should NEVER get near the turrets to harass the turret operators. If North Hills team is scrapped, fill their role as well and try to clear the fingers that spawn near the turrets if possible. Same as North Boats, kill the mobs that spawn on the south side of the turrets. If a Champion Hypnoss spawns, ask the ERT for assistance. Focus on kiting the mobs away from the turret operators. Watch for plague carriers that sometimes spawn. South Hills, like North Hills, should have a mesmer if possible to reflect poison when downing the fingers near the Southern Turrets. Watch the timer on the event to see when Mobs will be spawning and prepare yourself accordingly. The mobs that spawn here are generally weaker than the ones that spawn at the Boat teams. The ERT may be called upon to assist defense teams that are struggling or h champion mobs spawn. The ERT can be any class and will remain in the zerg unless they are called upon. When a defense team calls for an ERT, the ERT must get to the defense team as soon as possible to help defend against the mobs that spawn. When Tequatl enters a battery phase, the ERT will destroy the fingers that are left behind, as these fingers will continue to throw poison. After the ERT clears the beach (i.e., destroys all the fingers), they are free to go whereever to get credit for the battery phase. Just be sure to tag a few mobs to get credit so you can get your dragon chests after the fight. 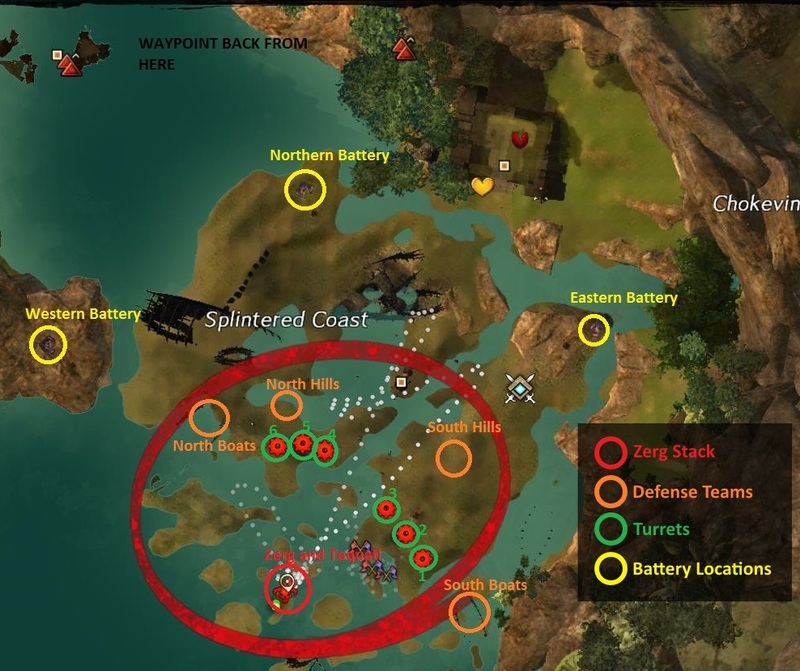 Once Tequatl enters Battery phase, you will defend 4 objectives on the map for 2 minutes. The 4 objectives are the Megalaser, Eastern Battery, Northern Battery, and Western Battery; if one of these objectives are destroyed, Tequatl will NOT be stunned by the Megalaser and he will create a tidal wave which instantly kills any player that is hit by it. It generally does not go past the turrets. However, since Tequatl isn't hit by the Megalaser, you miss your chance to burn. The Megalaser will have any mobs that were recently spawned and still living automatically target the megalaser and try to destroy it. Defense teams should notify the zerg if mobs recently spawned to prepare the defenders. There are mobs that spawn to the north, south, east and west of the battery. A lot of mobs are champions, but can easily be kited away from the megalaser. It's important to fight mobs away from the megalaser to prevent any AoE's from damaging it. If a champion grub spawns, kill it as soon as possible as it has devastating AoE attack that can badly damage the megalaser. The primary mob to kill outside of the grub (that is rare to have) is the Champion Hypnoss that spawns to the south of the megalaser next to the Northern Turrets. This is the only mob that will focus target the Megalaser, meaning he never will target a player and will always damage the Megalaser if in range. The best tactic is to immobolize the hypnoss. A ranger can keep him locked down with the elite skill "Entangle". He spawns about twice per battery phase. If he gets close enough to the Megalaser, he will start channeling an attack on the Megalaser, slowly damaging it. Luckily it doesn't hurt the Megalaser too bad, but if left ignored it can cause some problems. The Eastern Battery has mobs that spawn around it. However, it also has high chances of spawning plague carriers. These will target the player, but if they are a champion or elite mob and targets a player next to the battery, it can cause a lot of issues. The best counter for these is much like the bloated creepers. Have them target you away, and then dodge away from them once they start channeling their explosion. The other mob is the Plague Carrier Abominations, which are the same character model as the Bloated Creepers. These giant, undead Norns will also always focus the battery and never target players. Luckily they move really, really slow and have no stability. You can easily keep them locked down with CC's and knockbacks. Target these first. There are other mobs that will run to the battery, but their damage is really low against it, however shouldn't be ignored. Any area blinds will work really well against these mobs, such as blinding powder from a thief. The Northern Battery has grub holes that will pop up around the battery. If left unstomped, they will spawn veteran grubs that can do big AoE attacks against the battery. Luckily you can stomp these holes before they even spawn a grub. Grub holes always spawn in the same location, so you can camp a spot and stomp the hole when it spawns. Keep in mind that if you mash the F button to stomp, your characters animation will continue without stomping it. Just hit F once to stomp the grub hole. Fun fact, these stomps are a blast finisher. The mobs that spawn here are also a bit difficult to kill, as they are undead Quaggan and Hylek. The Hylek have powerful range attacks and sometimes hide in the water shooting at players or the battery. The Quaggan are also powerful melee enemies that can sometimes knock a player down. As always, blinds work really well against these mobs. If Grub holes aren't an issue, try to kill the Hylek first as the Quaggan can be kited around as they are fairly slow. The Western Battery spawns fingers similar to the ones spawned by Tequatl while fighting him up close. These fingers will throw poison at players and the battery. However, these fingers are generally a lot weaker with their attacks than the ones spawned at Tequatl. These fingers don't have much of an AoE, but they do target players and the battery and hit them hard if it does land. If you have reflects, keep them up around the battery and fingers to prevent them from being an issue. Watch out for the undead krait that spawn at the West as they have some fairly hard hitting melee attacks. If they are hitting the battery, as always, try to blind them. 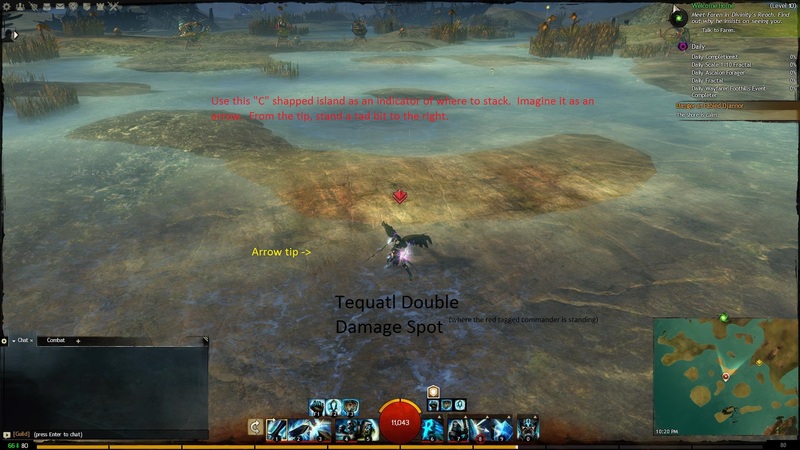 Note: Tequatl's Poop - Every so often, you will hear the Asuran commander lady on the map notify the map that Tequatl is inbound or attacking a battery. This means that he will fly over it and drop some AoEs. These cannot be prevented, but it's his way of helping his minions destroy the batteries. He will NEVER do this to the Megalaser, and only the batteries. He generally attacks all 3 batteries during a single battery phase. Luckily the AoE isn't much of a threat, but sadly prevents the raid from having a perfect battery defense phase as there is no way to prevent him from attacking and dealing damage to the batteries. It's just something small to watch out for, but is mainly harmless. As a joke, we call it Tequatl's Poop. Assuming the raid members successfully defended the batteries, the Megalaser will fire at Tequatl, stunning him. Once stunned, he will take much more damage per attack and will not fight back for about 30 seconds. 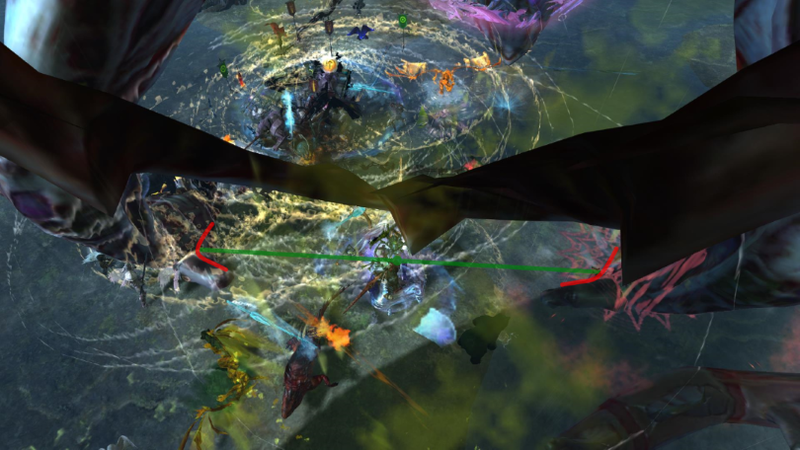 The zerg can start attacking Tequatl from the initial double numbers position while 5 seconds remain on the battery phase event. However, once he lands you want to stack as much might as possible, using as many might stacking abilities as you can. The commander will then switch to a different spot in which you can deal even more damage than from the original spot. During a burn phase do NOT be shy with cooldowns. Use what you can to do damage, as you will do MUCH more damage during this phase than any other time. The commander may call for certain people to drop their consumables if the DPS proves to be insufficient. It is also HIGHLY recommended that you do NOT range attack Tequatl unless you are traited to do a lot more damage with range. Reason for this is there are absolutely NO threats during a burn phase, and with the game mechanics in Guild Wars 2, Melee does a LOT more damage and it is much easier to get that double damage. You should already be meleeing anyways, but it is HIGHLY recommended to switch to melee to get more damage. Again, there are NO threats that could kill you during these burn phase (unless ERT didn't clear the beach). Tequatl will regain consciousness and start attacking after about 30 seconds of burning. If you chain burn (meaning he goes invulnerable again), be prepared for another battery phase. 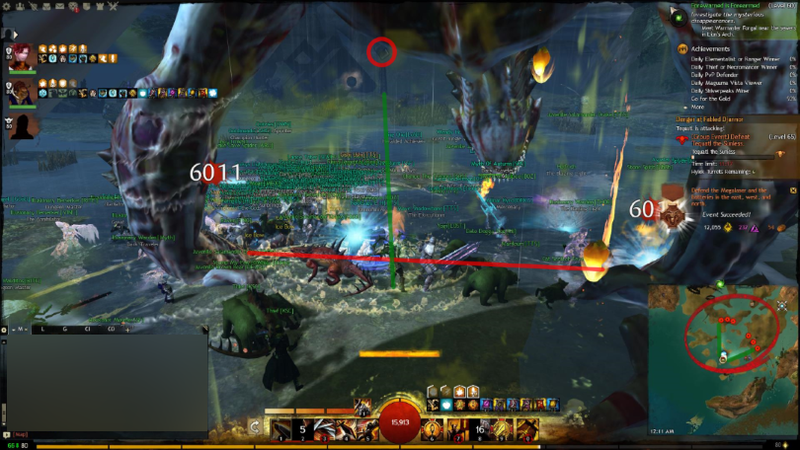 If there isn't a chain burn, follow the commander back to the original double numbers spot and continue DPSing and dodging Tequatl's attacks as in the main phase to put him into the next battery phase. Turret operators should go back to their turrets. Turret operators will continue to apply buffs (primarily the 4 skill) to the zerg while spamming the 1 skill for damage. The Commander will call for defense teams to either return to their defenses or join the zerg for the burn. TTS does NOT revive the DEAD. Only the downed. If you are being revived while dead, it is likely a player mistaking you for a downed player or a conjure weapon. If you are dead, use the Brooloonu Waypoint to the north and run back. When you run back, please run between turrets 3 and 4 to prevent upscaling of the defense teams. Unless the commander asks for parties. The reasoning for this is to prevent buffs from stacking duration rather than intensity. For example, a player in a party with might-stackers will get 25 stacks of might for a long time, where another member in the zerg has 0 stacks. You cannot get higher than 25 stacks of might, so the duration is increased rather than the intensity (meaning, the amount of might). It's best to give 6 people 25 stacks of might consistently rather than 5 people 25 stacks of might for an unnecessarily prolonged duration. Only defense teams and ERT should be partied for coordination. 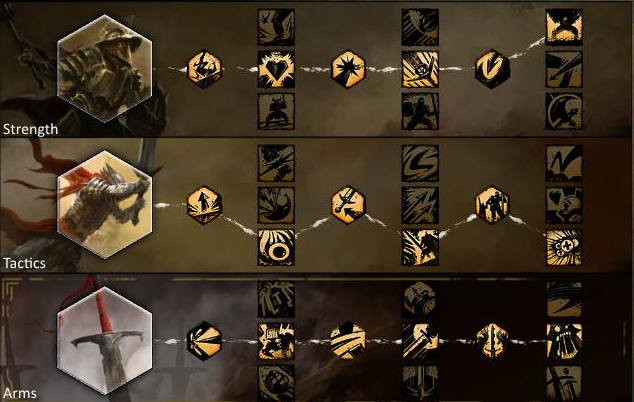 Even when stunned by the Megalaser, he cannot receive the stunned/dazed condition thus traits that give bonus damage to stunned/dazed enemies do not work. He can receive conditions such as blind and immobilize, but they do not have any effect on Tequatl. Tequatl is a general mob. Although Tequatl is undead, he is classified as a general mob and not undead. 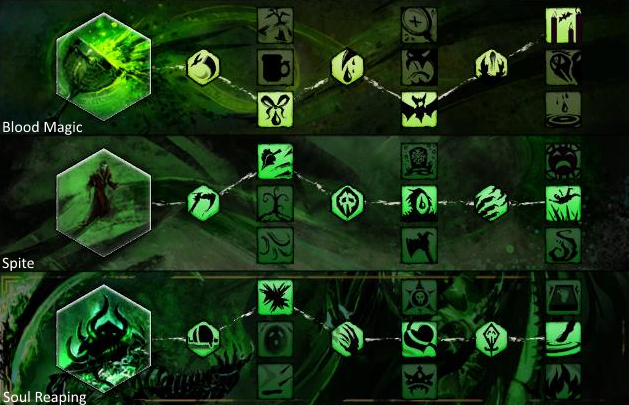 Any sigils/runes/potions/buffs that give more damage to undead do not increase your damage against Tequatl, but will increase your damage against his minions. Stack TIGHTLY on the commander. Remember to remain stacked TIGHTLY on top of the commander for the highest protection from poison and the most damage against Tequatl. Few things to note - this guide is NOT 100% complete, and never will be simply because the game does update. There also may be a few minor things changed even without game updates. Anyways, awesome guide. The gifs are a nice touch. kind of, but don't you have to point a certain way? (like I've heard with the triple damage/double leg spot under teq you have to face the cube on Lab) And is it supposed to be with all auto attacks or only some? 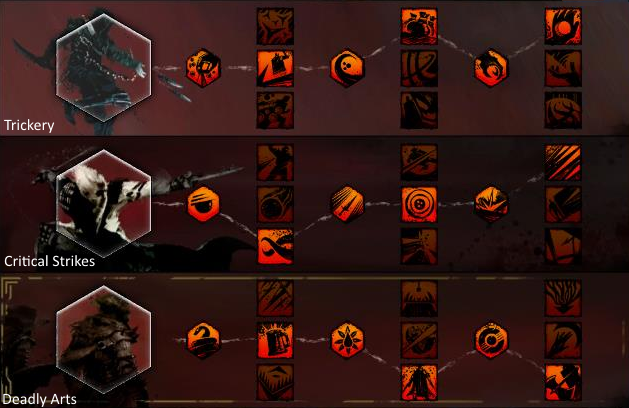 The DD spot is a bit tricky and not all classes can do it properly. Guardians, Warriors with Greatswords, Elementalist Lightning hammer, Ranger just needs to stand in a straight line with the legs and have the precising trait for Long bow, same with Mesmer greatsword, Swords can't reach enough to cleave the 2 legs. It is the guardian greatsword I use, but seems like I can't get it, but maybe I'm point camera to wrong back foot. Will have to try looking straight towards same back foot instead this weekend. I just need a better bird's-eye view of the spot, and I can post a few of them with tips :D.
Also, with guardian gs, I only get dd with auto-attack and not whirling wrath, unless a stray projectile hits teq. Mesmer sword can do DD, just requires a bit of finer placement. Dagger Necro and Sword/Dagger thieves can also hit the DD pretty easily. Basically any attack that is cleaving will hit the DD spot. What DD spot are we talking about? I hit both the fight phase DD spot and the burn phase. If you're talking about the one facing the cube, I don't think it's quite worth attempting until more people are familiar with it. It DOES give more damage during burns... if people are getting it. But most don't. I'll try to make a video of it when I'm more familiar. Open with Strength of the Pack - Fire rapid fire for all 3 hits. Spam 1. YOU MUST HAVE THE FAR FOOT TARGETED. NOT THE HEAD OR NEAR FOOT. *clarion bond i'm pretty sure. also your sending it in first before you use anything because you want to buff your swapped to pet not the first pet out. New editted version is up! Thanks to Mealla for making it look much better! On a side note... found the other damage spot. I am a thief with dagger, but you do have to be at the EXACT spot. Going to look to find anything near the area that might help mark where you need to stack without wasting DPS trying to find it. hmm, will have to give these a try this weekend. I can get triple damage with Guardian Staff auto attack. I tested it, and you are right. I can rack up about 9-10K DPS during the burn phases with greatsword, and around only 6-7K DPS on Staff seeing Triple damage. Mesmer video is uploaded and in the Mesmer section! Next up is Engineer!